Vanilla Pumpkin Waffle from Goose Creek was a “no brainer” purchase for me. I HAD to have this candle the moment I saw it. So what did I do? I bought two. One to review, and one to simply enjoy down the road. Nice description with a lot going on but to me, the wax smelled pretty straight forward… vanilla, pecans and maple with maybe hints of butter. I didn’t smell any apple or musk and I was perfectly okay with that. The scent “as is” was pretty perfect just as it was. I decided to burn this candle in a medium size room to start out. I wanted maximum scent throw and definitely got it burning it in a smaller room. Once the candle was lit, it took about 30 minutes to reach a full melt pool and the aroma… Mmmm!! So yummy!!! Imagine the creamiest vanilla with layers of maple, sugar and roasted pecans. I didn’t really smell pumpkin or cinnamon. To me, this scent was all vanilla and it was perfect!! Strength – on a scale of 1 to 10, I would rate this candle a 7 in small to medium size room. 5 or less in a large room. This candle was definitely best burning in a smaller room for maximum scent throw. 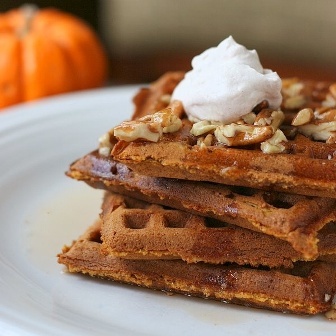 Loved Vanilla Pumpkin Waffle from Goose Creek. 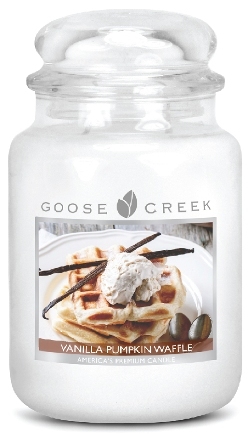 It sort of reminded me of Bath & Body Works Pumpkin Pecan Waffles but Goose Creek’s version had a lot more vanilla in the mix so it was a tad different. I loved it and look forward to burning this candle again.